Today has been a travelling day, mostly. I left the hotel in Batu Feringgi at abound 9 o’clock for a flight at 12:15. So there was the usual ‘hanging around the airport’ thing before a very efficient and short flight back to Singapore. A taxi ride from Changi airport got me to my hotel, the Changi Village hotel (in Changi village) by about 2:15. I spent the latter part of the afternoon taking a walk around Changi Point. This turned out to be very hot (surprise) and I was pretty much melted when I got back to the hotel. I had been researching local restaurants & bars, but I decided instead to spend the evening in the hotel. So I had a meal at their Italian eatery, the Cantina of Venezia, on the 8th floor which had an outdoor terrace. I don’t think the food was very special – certainly not worth what I paid for it – but the setting was sensational. It seemed that I was looking down on the jets coming in to land at Changi airport. Then I blagged my way into a gathering of regular guests that was arranged by the hotel administration – a sort of ‘keep in touch with your customer’ do, with canapés, little desserts, and drinks. OK, I didn’t blag my way in; I peered round the door, asked what was happening, one of the staff asked me if I was actually staying at the hotel and when I replied that i was, practically hauled me in. I ended up having a fascinating conversation with a French couple who knew northern England very well – they’d been married in Liverpool and knew and liked the Lake District very much. I need an early night tonight. The flight to Dubai is at 9:35 tomorrow morning, which means I have to be on the shuttle to the airport at 6:30, which in turn means getting up at about 5 am. Bed, here I come. On the afternoon of my third day in Singapore I visited Gardens in the Bay. This is a sort of ‘hi-tech eco paradise’ – or at least, that’s how it’s intended.If you know the Eden Project in Cornwall you’ll get the idea, but with added technology. Update: here’s the text! Gardens by the Bay consists of three broad areas. First there are acres of ‘walk around’ areas, laid out in gardens. For example, there’s the Chinese garden, the Malay garden, and so on. There are also large areas of open grassland. In fact this area is pretty much like a botanic gardens, and is also free to enter. The second area are the two domes – the Flower Dome and the Cloud Forest, and they’re not free. These are both enclosed and controlled environments. The Flower Dome contains flowers and other plants from the several Mediterranean climatic environments around the world – California, South Africa, Chile, and of course from around the Med itself. This is interesting enough, but (unless you’re a plant enthusiast) not exactly spectacular. It’s saved, however, by the presence of additional ‘exhibition’ displays, and when I was here they had displays of cherry blossoms. These were very popular, with queues of people being photographed beside and among the blossoms. I took some images of this blossom myself – examples below. Then there’s the Cloud Forest dome. This is an artificial reconstruction (and explanation) of the way vegetation on a mountain is stratified by the climate that is present at a given altitude. So particular species of plant will only exist on the mountain within a fairly narrow range – no lower than a certain height, and no higher than a certain other height. For this example they’ve picked plants that thrive in the ‘cloud zone’ – temperate climate (in fact blissfully cool) and with plentiful moisture, mainly from the clouds that form around the mountain at the relevant altitude. In the case of the Flower Dome you just walk around the floor of the dome, but it’s a bit different for the Cloud Forest dome. There’s an artificial mountain, some tens of metres high, with plants growing all the way up it. I gather that in fact these plants are zoned – that the climate isn’t constant throughout the dome – but I didn’t really spot any great difference. But having marvelled from the ground at it all, you then get to ascend by lift to the fifth or 6th floor, from where you walk down. Some of these walks, as you can see from the images below, extend out from the ‘mountain’ by many yards. Presumably so you can appreciate the thing in all its glory, I expect – certainly not just to give the visitors a thrill! Basically you gradually descend round and round the mountain, sometimes passing through it, sometimes on a walkway out in the air, until you reach the bottom. But that’s not all! I said that it replicates moist conditions. So how can they do that in an enclosed dome in equatorial Singapore? Well, every couple of hours or thereabouts they ‘mist’ the mountain – hundreds of tiny vents issue a fine spray or mist of water which moisturises the plants. Of course it looks spectacular (again, see a couple of the images below) but I’m sure that’s just a happy accident. Truly weird sculptures – most of their bodies are missing…. The next spectacular area of the Gardens is the Supertree Grove, together with the associated Skyway (there’s an extra charge for this). 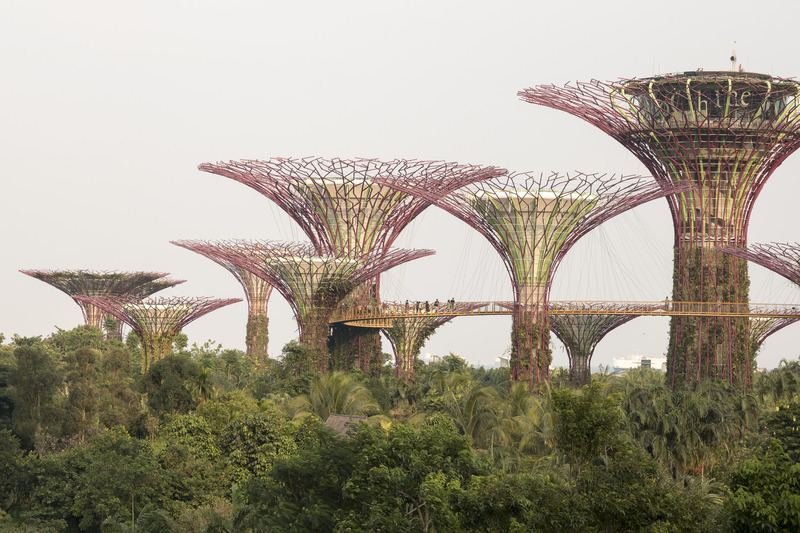 The Supertrees themselves are between 25 and 50 metres high, and actually perform engineering functions for the park – e.g. as air exhaust outlets for the cooled conservatories. They’re each mode up of a concrete core; a steel frame exoskeleton; and onto that are fixed millions of plants. The Skyway is a 138 metre walk between two of the medium-height trees. I enjoyed the afternoon I spent there. To be honest, I think that unless you were interested in horticulture or botany much of the open gardens might be a bit ‘blah’. But the two conservatories are amazing, especially the Cloud Forest, and the Supertree Grove is just one of those ridiculous things that’s actually wonderful. I gather that at night they illuminate the Supertrees…. maybe next visit. I spent this morning exploring Little India, the area near to my hotel. It’s a much more traditional area than most in Singapore; it features mainly low-rise buildings, with traditional shops spilling out onto the pavement (or rather, the pavements almost run through the fronts of the shops). As its name suggests it’s a predominantly Indian area of Singapore – Indians, or Singaporeans of Indian origin, make up about 10% of Singapore’s population. (The overwhelming majority are of Chinese descent – almost 75% of the population.) The walk was hot but interesting. I visited a Buddhist temple, inside which is a 50 feet high statue of the Buddha, made of concrete and weighing, it was suggested, about 300 tons. It was built in situ in the 1930s, inside the already-constructed temple. I spoke to the attendant/guide and we had an interesting conversation. This resulted in the strangest thing (or most unexpected) that I’ve heard in a long time. I told him where I came from and he replied saying that he really liked English TV; and then he mentioned ‘Allo ‘Allo as a particular favourite….. In the afternoon I visited the Gardens by the Bay, but that deserves a post of its own. I seem to be falling behind myself in terms of posting here. It’s now the end of today and I haven’t done yesterday’s post yet. Yesterday morning I slept late (surprise) and didn’t wake up until 9 o’clock. So what with shower, breakfast, etc, it was quite late before I set out for the day’s plans. I decided to visit the National Museum. This tells the story of Singapore from the earliest known records or artifacts up to the present.You’ll not be too surprised to learn that it’s the history of the last half-century which takes pride of place, and why shouldn’t it? While Singapore was prosperous and busy in 1963 (the year it gained independence from Britain and entered the Federation of Malaysia), it wasn’t at that time a first-world city with extremely strong positions in shipping and finance, whereas today it is. So well done Singapore, and the museum tells the story of the struggle for independence and how it achieved with it fairly and without rancour. I learned a lot especially from the “How we built” special exhibition which details how Singapore was rebuilt and expanded from the 1970s onwards; a process that hasn’t stopped yet. After that I explored the Singapore River area, and that was visually interesting and attractive.